2014.08.24 - The Heart of Neolithic Orkney placemarks file for Google Earth contains placemarks for the major sites with selected Panoramio photos and, illustrated with tesselated lines between sites, some selected study results. The most interesting result, especially in the context of the Stonehenge and Pi finding, is depicted in the image below. 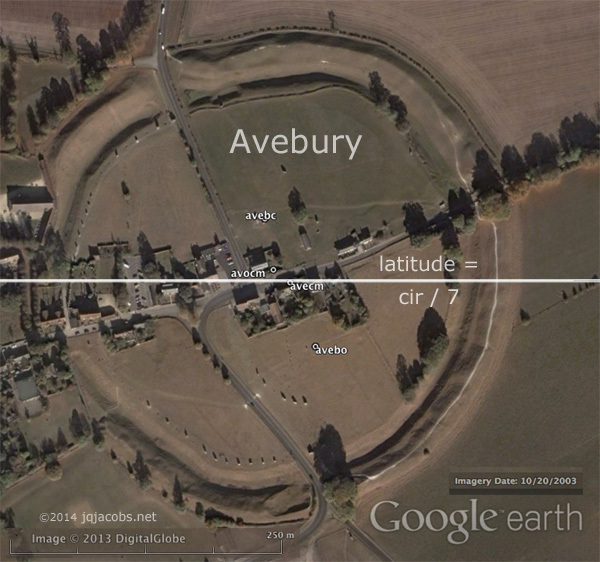 Regarding the data points for Avebury, the site code 'avecm' is Avebury Circles, the mean of the monument centerpoints of the two inner stone circles. Data code 'avocm' is a coordinate resulting from the mean of the 98 standing stones in the large Avebury circle, about a 20 meter difference in coordinates on the ground. Utilizing avocm to represent the Avebury Circle latitude and longitude results in the ratio being accurate to a fraction of a meter instead of having an under five meter error. 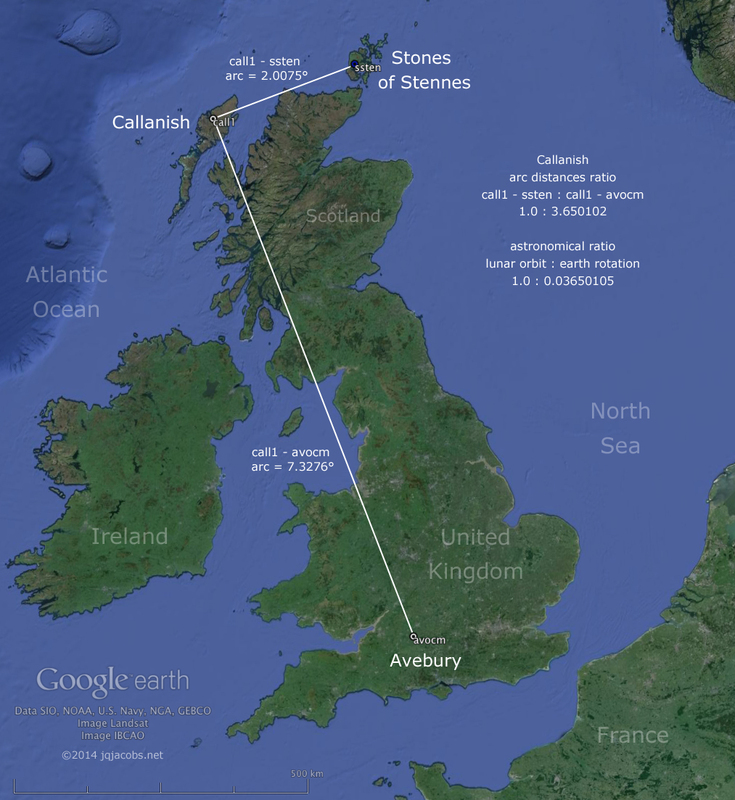 In comparison with the Stonehenge and Pi finding, the Callanish-Orkney arc is far longer than the Avebury-Stonehenge arc (which expresses the ratio 1.0 : 10 pi in relation to the Stonehenge to Ring of Brodgar arc). With longer arc distances, far greater accuracy expressing a pre-determined ratio is possible with the same distance error margin of monument placements. This proportional advantage is useful both to the assumed Neolithic builders and the researcher. Expressing the actual astronomical ratio, 1.0 : 0.0365010, would not have this advantage. The ratio 1.0 : 0.0365010 is nonetheless expressed by three Orkney monuments. The ratios posted in the placemarks results folder include two Orkney monuments expressing two different 1.0 : pi ratios. If you cannot open Google Earth files, any KML file will also open as a text files with markup. All this means nothing, of course, without the assumption of intentional Neolithic construction expressing the most fundamental observable astronomical ratio on the scale of the British Isles and all that that implies about surveying and precise scientific astronomy. Also, the results do not express margins of error in the method employed to determine coordinates. Those margins of error are greater at each data point than the resulting ratio is inaccurate (accuracy is within 5 meters for the 2.0075° call1-ssten arc given call1-avecm as the other arc). For intra-site considerations with sites as close to each other as the Ring of Brodgar and the Stones of Stennes, the proportion of the margin of error to total arc distance is significant. Precision is essential for intra-site study because the builders could achieve direct measure. My results can be tested with better methods, and the closer the two sites to each other, the better the methods required. What I need now is reliable GPS survey data and testing of such GPS coordinates. Any chance we can crowd source this? Please contact me if you have the data. Meanwhile, let's not get overly excited about the implications. This is not a permalinked post, but I'm excited and I'll admit, I'm not revealing the whole story...yet. 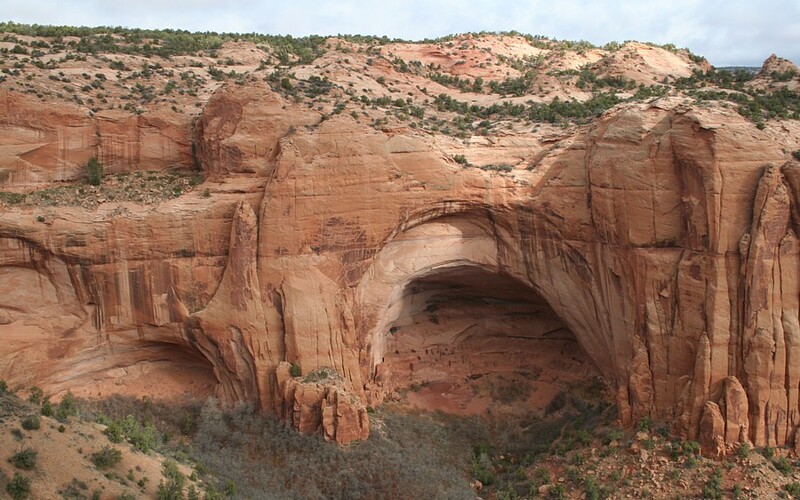 If this is the only part of the story you have so far, continue reading this blog and domain for far more about ancient geodesy, astronomy, and archaeology. 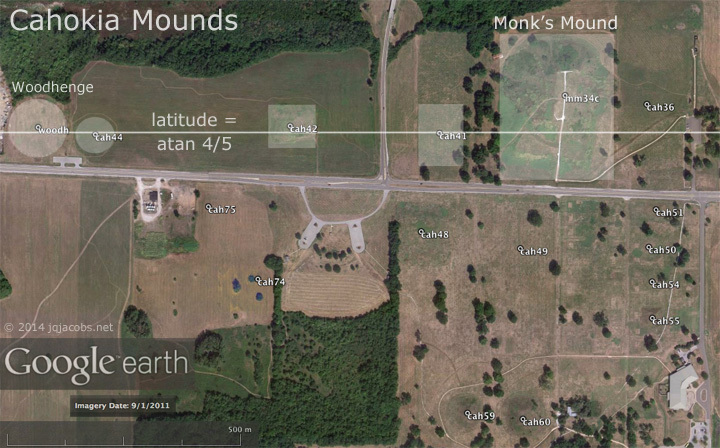 "Given latitude placements are intentional, positioning monuments evidences the earliest known precise astronomical and geodetic measurements. Spanning the range of their construction, the greatest of ancient monuments evidence a capability of accurately determining latitude. The earliest evidence of astronomical observatories using exact sciences may also be implied by latitude positioning." 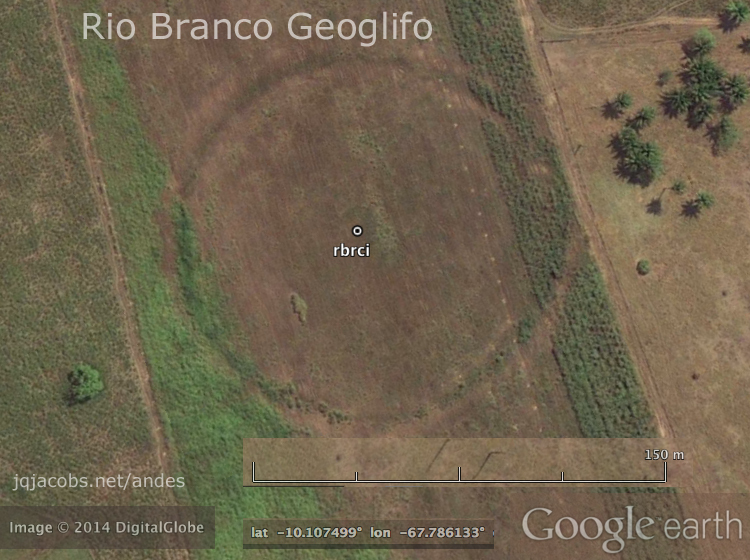 2014.02.02 - Hundreds of Geoglifos Discovered in the Amazon article updated with newly discovered geoglyphs, twenty new photographs, new videos, additional placemarks and links, and a database file. With the newest Google Earth high-resolution aerial photography updates, there are now 240 geoglifos placemarked, plus many ground lines. The new discoveries extend the area of geoglifos east, west, and south, including just across the border in Bolivia. Download brazil_geoglifos.kml placemarks for Google Earth. Read article. 2014.02.14 - Updated archaeogeodesy.xls v2014 includes the new geoglyphs and additional sites worldwide. The Excel applet provides numerous ancient astronomy research functions and calculates arc distances and bearings for three sites, providing coordinates for mounds, pyramids, monuments, and other sites worldwide. 2014.02.19 - Updated placemark files: Mesa Verde, Colorado, Hovenweep, Utah, Salinas Missions. 2014.10.08 - Fifty-six new Amazon geoglyphs have been noted where Google Earth images were recently updated, including an area near Boa Vista, Amazonas rich in monuments and lines (image below). Additional geoglyphs placemarks file: http://www.jqjacobs.net/amazon/geoglyphs.kml. 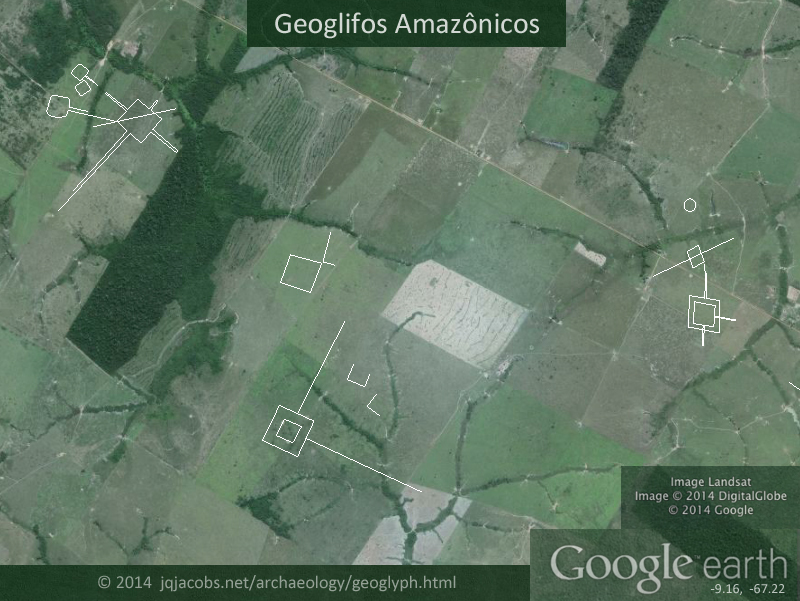 2014.12.12 - Nearly 400 Amazon geoglyphs are now surveyed. All the visible lines and the largest earthworks are outlined. I continue to monitor Google Earth imagery updates of areas without sufficient resolution currently to view geoglyphs. 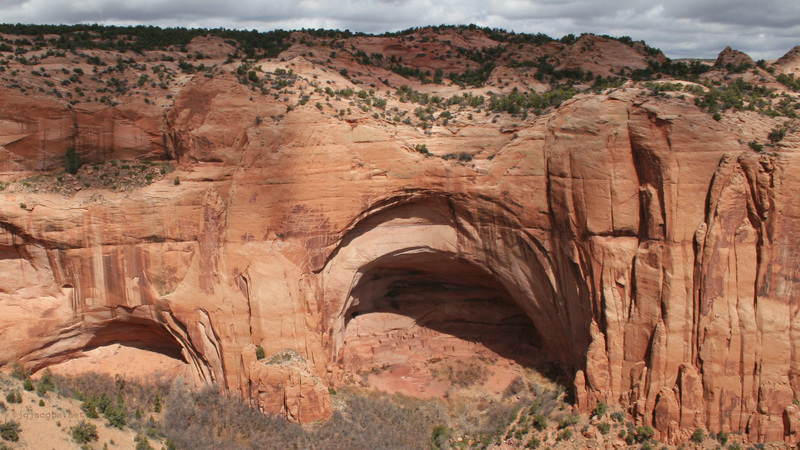 A few such areas remain near some of the largest earthworks and concentrations of the earthworks. 2014.12.21 - Updated placemark files: Poverty Point, Pinson Mounds, Blythe Intaglios. 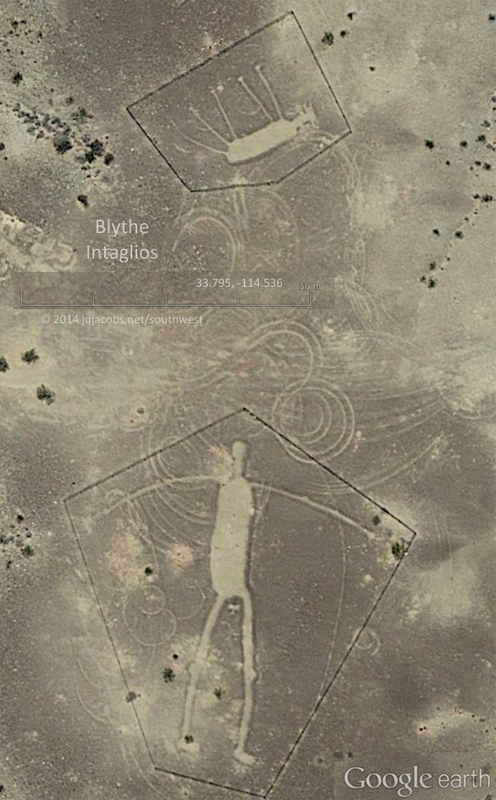 The Nazca lines Greenpeace damage drove attention to my Blythe Intaglios page. In response to demand, I updated with aerial images and the new Blythe KML file. © 2014 by James Q. Jacobs. All Rights Reserved.